Home » News » Anti-Inflammatory and Anti-Aging! 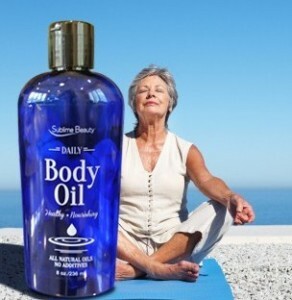 Our new Daily Body Oil has great anti-inflammatory and anti-aging qualities! The skin is the largest organ of the body, and forms an important barrier of protection. Caring for the skin with pure ingredients can benefit not only well-being but the look and quality of the skin. The Daily Body Oil was designed by Sublime Beauty® and a chemist to address important issues like inflammation and irritation, aging or dry skin, stretch marks, wind or sun damage and even natural anti-bacterials. The proprietary blend of oils includes Sesame, Sweet Almond, Aloe, Jojoba, Argan oil plus Vitamin E. Each has amazing – and somewhat different – qualities, and purchasers receive a seven page report all about the oils. For instance, Sesame is known to have naturally anti-bacterial properties for skin pathogens; Jojoba can reduce wrinkles and fine lines in the skin; Argan oil contains plant sterols that are not found in any other oil; Aloe has more than 75 different nutrients including vitamins, minerals and enzymes (and is high in Vitamin C and E) plus anti-inflammatories; and Sweet Almond is high in oleic acid which is superior for dry skin, eczema or chapped skin.